Minimum charge of $90 will print up to 2 cartons (500 bags). $110 will print 3-4 cartons. Then $110/1000 bags thereafter. Different bag sizes are allowable, using the same printing plate. All orders ship 3-4 weeks after art approval. 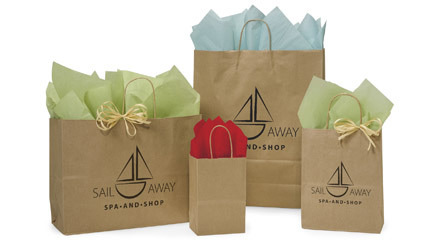 Natural and White Kraft paper shopping bags are printable with standard inks. This type of printing provides good ink coverage and is less expensive than hot-stamping. 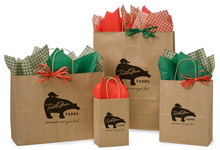 Choose dark inks for printing on natural kraft bags (black, dark brown, red, dark green, maroon, or navy). 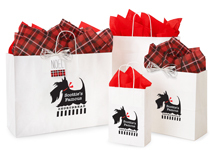 White kraft bags are suited to nearly any color. For printing plate or color changes during an order, add $40 per change. For an oversized image area add a 25% upcharge to the standard rate. There is a one-time plate cost for ink-printed orders of $95 up to 50 sq.in. Price includes normal typesetting, scanning, pre-press work and proofing. We will be glad to discuss large quantities, large coverage or unusual artwork - just give us a call! Click here for information, call us at 1-800-547-9727 or email us today!